What fans leaving the stands and viewers turning off their television sets thought to be true on Saturday night after the NASCAR Toyota All-Star Challenge at Irwindale Speedway has changed. NASCAR announced on Tuesday that Busch North Series driver Mike Olsen, the first to cross the finish line in the Grand National portion of the event, was disqualified from the race after a rules infraction regarding the wheels on his #61 car, fielded by Fadden Racing. The decision has resulted in West Series regular David Gilliland being declared the race winner. The wheel problem was discovered in post-race inspection and Olsen’s crew chief Harry Norcross was determined to be in violation of Section 12-4-A (actions detrimental to stock car racing) and Section 12-4-Q (car, car parts, components, and/or equipment that do not conform to NASCAR rules) of the NASCAR rule book. Olsen’s car had unapproved right-side wheels which exceeded the maximum width of 9 ½ inches and were less than the 27-pound minimum weight. 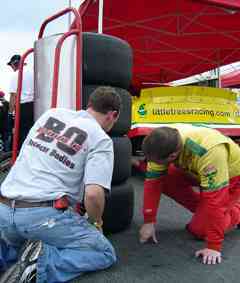 Wider and lighter wheels would help to improve the handling of a racecar. Olsen’s car was especially good on the bottom of the track in Saturday’s race. “Fadden Racing, Inc. will appeal the penalty NASCAR handed down today to Harry Norcross, crew chief for the No. 61 Busch North Series car, as a result of a rules infraction last weekend at Irwindale Speedway. “Alvin Fadden, Team Manager of Fadden Racing, Inc. ‘The infraction was issued to the crew chief, and NASCAR essentially penalized Mike Olsen. Norcross had been with the team for more than a decade and was a childhood friend of Olsen’s. His departure was as surprising to the Busch North community as the penalty itself. Before the infraction was discovered, Olsen was ecstatic about the victory. The personable driver called it the “biggest win” of his career “until I win the Milk Bowl and get to kiss the cow.” Olsen was especially excited about sharing it with his son Ryan, who turned nine on the day of the race, and his grandfather Stub Fadden. 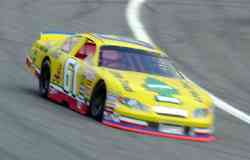 Fadden had been a notable Busch North driver himself with four career victories. He has been recovering from a stroke recently and Olsen got the chance to make a prediction to him before leaving for Irwindale. The disqualification is the latest in a series of penalties assessed in Grand National competitions that have been seemingly harsher than those issued in the NASCAR Nextel Cup and Busch Series. Ryan Moore was suspended for the Busch North finale at Thompson after a post-race incident at Lime Rock and Mike Stefanik was sent to the rear of the field for getting spun under caution in the Irwindale race after the field was frozen. NASCAR stated that Stefanik’s penalty was because he failed to maintain a reasonable speed under the caution laps. Stefanik did not agree with the assessment and parked his #55 car, retiring from the event instead of going to the rear of the field. In NASCAR’s top divisions, there have been losses of points and hefty financial penalties levied against teams failing post race technical inspections, but race victories have been allowed to stand in recent history. 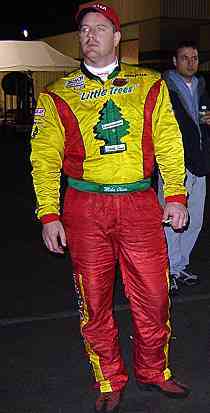 In NASCAR’s Touring divisions, Todd Szegedy was disqualified from a NASCAR Featherlite Modified Series event at Thompson in 2004 for a rear end gear violation. Likewise, a rash of on-track altercations and collisions in the top levels of NASCAR this season have resulted in fines and point penalties, but nothing as harsh as Moore’s Busch North suspension. “Mike Olsen, Harry Norcross and the entire Little Trees team are a class act; even with the penalty and subsequent loss of the Showdown win, which is unfortunate. Mike, Vicky, Harry, Karen, and the crew - you have lost NO credibility as far as we are concerned. “This single mistake is NOT indicative of the way the Little Trees team races or competes. Their integrity has been seen and felt by every competitor and team in the garage for the last 15 years and should not be overlooked or forgotten during this time. They made a mistake. They are human. “During the broadcast, Andy commented that there is no other driver he would rather have behind or beside him battling for a win. That absolute trust and respect should be remembered and considered at a time like this. Speed51.com will have more on this developing story as it unfolds. Mike Olsen istands by in the pit area after the Irwindale race.